A surprisingly picturesque scene from a barren, icy rock. A surprisingly picturesque scene from a barren, icy rock. 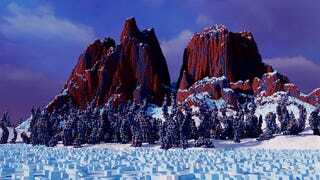 The subject is a Minecraft map called Frozen Mining Moon, created using WorldPainter by Moonti of Planet Minecraft. You can download the map from the project's page here, and there's more renders below, along with a lovely flythrough video from EnderWorkbench.